You don’t always get to choose the circumstances of the first time you get to see an animal, and this one was certainly such a case. This sliver of scale was all I ever saw of my first Red Diamond Rattlesnake, Crotalus ruber. 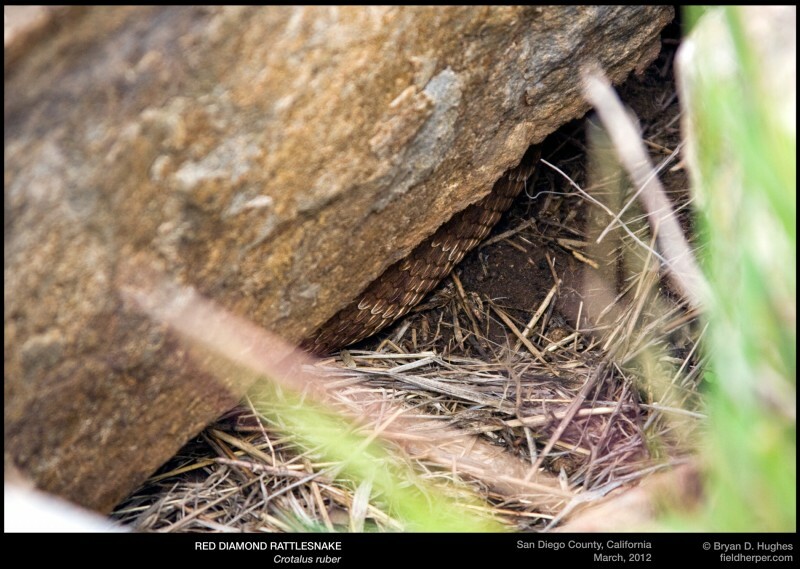 Fortunately, we saw another 23 that day, and a spattering of Southern Pacific Rattlesnakes (and a lot of other stuff, too), so I’m quite happy with having left this one exactly as is, as we did. This entry was posted on Friday, August 29th, 2014 at 8:21 am	and is filed under Field Herping, Personal, Photography, Snakes. You can follow any responses to this entry through the RSS 2.0 feed. You can leave a response, or trackback from your own site.